We believe in natural alternatives to nutrition and grooming! When you get your pup home they may be a little stressed so I suggest giving some Light Karo Syrup or Nutrical if the pup’s gums get white or grey. For daily feeding I suggest Wildology Chicken Puppy Food (available at D&B Supply). Please note that NUVET PLUS supplements are required as part of your pet’s Health Guarantee. Whether you purchase a Maltese, Coton de Tulear, Yorkshire Terrier, or a rare Biewer Yorkie, you will want to check out these all natural chemical-free products. We believe in all of these products! I’ve seen some amazing things in my day, but this takes the prize. Nu Vet Vitamins are the best nutritional supplement I’ve ever seen. I saw it dissolve a cancerous tumor on my 12 year old dog and she lived to the ripe old age of 20. That made a believer out of me! This is not a vitamin. It’s an immune system builder with a precise balance of vitamins, minerals, omega fatty acids, amino acids and high-potency antioxidants. That’s why it works so well through all three stages of a dog’s life. For younger dogs (under 2 years old), it strengthens their immune system, while building and strengthening the cardiovascular, skeletal and nervous systems. For dogs in their prime (age 2-8), it improves the luster of their skin and coat while protecting against allergies, skin and coat problems, staining from tears, digestive problems, etc. For older dogs (over 8 years old), it helps reduce and eliminate arthritis, tumors, premature aging, cataracts, heart conditions, diabetes and many types of cancer, while extending the life and improving the vitality of most dogs. NuVet Plus will keep your pet on the path to perfect health! It’s not available in stores, and is only available to the general public with an order code from an authorized pet professional. For your convenience, you may order directly from the manufacturer (at up to 40% off the retail price) by calling 800-474-7044 and using Order Code: 51524, or ordering online at www.nuvet.com/51524. Also, by using auto-ship you can save an additional 15%. The pup will come with a small bag of dry puppy food, the AKC papers (for breeding dogs only), the shot and deworming record, Parent’s pedigrees, along with the Bill of Sale and written health guarantee. I have included a sample of the NuVet Plus vitamin tablets I have all of my dogs on (again, you must keep your dog on this vitamin in order for your Health Guarantee to be valid). Remember that the pup needs to have all of its three puppy shots prior to taking them out in the public; so use some caution in taking them to public areas and exposing them to diseases until they have had all of their shots. Your own yard is safe but use some caution with the potty-training. The pup is used to going on newspaper so you might put some in a box for them to use on the way home. I use natural things to repel fleas and ticks on dogs like Cedarwood oil at base of neck and tail and there is a supplement called Flea Away that will work also. Giving small dogs chemicals can cause seizures and blindness. I kennel train all of my pups. I sleep them in the kennel beside my bed on a chair (so they can see me). If I know that they don’t have to potty and they are just fussing, then I take a rolled up newspaper and swat the front of the kennel and tell them “Go to sleep!”. They need to know who is boss. Most people make the mistake and put the new pup in bed with them when they aren’t house trained. In the morning if they cry, ask them “Do you have to go potty?” and take them out the same door. Always praise them when they do. Then bring them back inside to play or eat. I suggest getting an 8″ expandable cat collar with a bell on it so you know where the pup is at all times. If you have to be gone during the day you will need a 2′ wire exercise pen (from Amazon) so they will have some playing room but won’t be able to get into trouble while you are gone. Put their kennel in their and also food and water along with play toys. Put some newspaper down at one end of the floor. A smart dog will start to hold it because they don’t want to soil “their area.” If you give them the run of the house, they will go behind furniture and go. This starts a bad habit and you want them to have good habits. If by 3-1/2 to 4 mo. of age they are still having accidents, you should catch them in the act and swat them with a newspaper and tell them “NO!” Then send them to their room (their kennel) and make them stay there for a while. When they cry again, take them to the door and outside and repeat “Go potty!” A puppy is like a child, they respond to love and discipline. I am a professional dog groomer and I highly recommend the chemical-free products in the Miracle II Products. We bathe all our puppies in the all natural Miracle II Moisturizing Soap. It actually pulls toxins from the body and leaves the hair and skin in wonderful condition. I use the Gel for brushing their teeth and I put the Neutralizer in their water to keep bacteria from growing in their mouths. Click on the link above to check out Miracle II products. The soap is very concentrated and needs to be diluted. I also use a leave in conditioner called Cowboy Magic De-Tangler for their coats. Several things can cause eye drainage: 1) using laundry detergents that are not biodegradable; 2) using fabric softeners; 3) feeding dog food or treats with corn or wheat in them; 4) burning scented candles or plug-ins. I use 7th Generation or other biodegradable laundry soap in my washer and the sponge balls in my dryer to eliminate static from the clothes. The pup comes in contact with your clothes and gets allergies. Try to eliminate chemicals when you clean your floors and rugs also. The other thing that helps is feeding the NuVet vitamin I recommended and no corn or wheat in food or treats! For many dog owners, finding the time to take your little one on a brisk walk every day can be a real challenge. 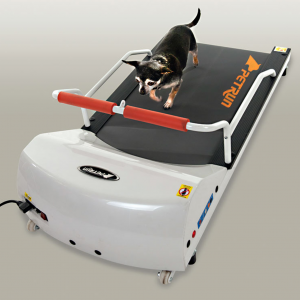 For busy folks who can’t find the time for daily walks I recommend a dog treadmill from DogTreadmillHQ.com. This retailer strictly sells the very best brand names of doggie treadmills on the market today, and stand behind them with their 6-month money back guarantee. A 20-minute brisk walk on dog treadmill each day can significantly improve your pet’s health and extend their life as well. Use promo code NICOLASPETS during checkout on their website for an instant $10 discount! Much like us humans, as dogs get older their joints and hips can start to ache from arthritis. Jumping up to & down from high places (like couches or beds) can greatly increase the amount of joint and hip discomfort dogs sometimes begin to feel in the latter years of their lives. For this very reason I highly recommend the high-density foam ramps and stairs offered at PuppyStairs.com. 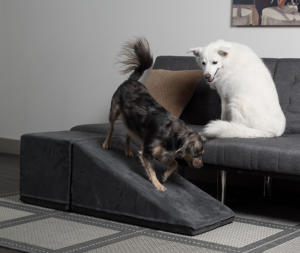 They are the most well-made dog ramps & stairs available. Utilizing these products for the entire life of your dog is a great way to prevent arthritis in the latter years of your dog’s life. And if your dog is already getting older, these products can greatly reduce the discomfort of getting onto or off of the various furniture pieces in your home. Use promo code NICOLASPETS during checkout on their website to get an instant $10 discount! If your dog ever suffers an injury that severely affects the strength of their legs or hips I recommend a dog wheelchair from DogWheelchairHQ.com. The same promo code NICOLASPETS will get you a $10 discount there as well! JESUS –THANK YOU FOR TAKING MY PLACE ON THE CROSS!